People with Down's syndrome, autism and other developmental conditions often have problems with proprioception: that sense of awareness of our body's position. It can cause balance and coordination difficulties and make it especially difficult to ride a bike. 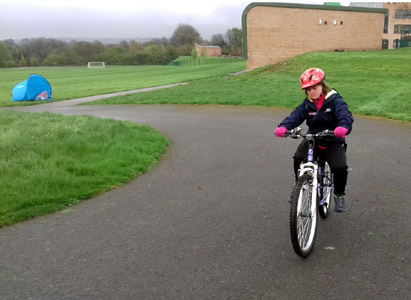 But they may be able to learn how to ride a trike and the practice pedaling builds up strength - apart from being great fun and building confidence. Some may find that riding a trike is enough - and that's OK. But some learn later to ride on two wheels initially using a balance bike. Most commercial balance bikes are aimed at tots, but its easy to take the pedals off a normal bike (Top Tip: the left pedal has a left-hand thread!) and lower the saddle so that the rider can easily get her feet on the ground. Find some flat tarmac or a gentle slope. Show the learner that the front brake can buck the bike and threaten to throw the rider over the handlebars. Better to use the back brake to slow down. Get the rider to stand left side of the bike and grab hold of the back brake lever (usually on the left) to stabilise the bike as they mount up. Release the brake but keep the hand on the back brake lever ready to slow down. Then use both feet, preferably together, to gain a little speed before lifting them both off the ground to glide. Scoot, scoot, glide; scoot, scoot, glide. Then it's about practice, perseverence and maybe success will follow. We now realise that using stabilisers doesn't address the main problem : achieving balance and controlling it by steering - that's why balance bikes are now considered key for teaching people how to ride; see e.g. : Learn to ride a bike 5 steps and Learn to ride a bike as an adult . Lift those feet up, glide, and keep on trying! Our club now has two bigger-than-toddler size dedicated balance bikes. These are bikes that have had not only the pedals, but also the cranks and bottom bracket removed. That means nothing to catch on the ankles when trying to propel the bike. They are good quality frames, so relatively light. This makes it easier to find the balance and keep it going. 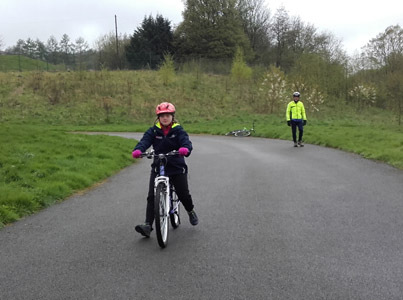 Forge Valley cycle circuit is the perfect place to learn, no cars, and a gentle slope at one end to practice on.